'Deflationism' has emerged as one of the most significant developments in contemporary philosophy. It is best known as a story about truth - roughly, that the traditional search for its underlying nature is misconceived, since there can be no such thing. 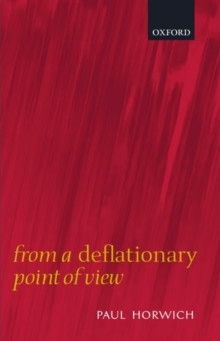 However, the scope of deflationism extends well beyond that particular topic. For, in the first place, such a view of truth substantially affects what we should say about neighboring concepts such as 'reality','meaning', and 'rationality'. And in the second place, the anti-theoretical meta-philosophy that lies behind that view - the idea that philosophical problems are characteristically based on confusion and should therefore be dissolved rather than solved - may fruitfully be applied throughout the subject,in epistemology, ethics, the philosophy of science, metaphysics, and so on. The essays reprinted here were written over the last twenty five years. They represent Paul Horwich's development of the deflationary perspective and demonstrate its considerable power and fertility. They concern a broad array of philosophical problems: the nature of truth, realism vs. anti-realism, the creation of meaning, epistemic rationality, the conceptual role of "ought", probabilistic models of scientific reasoning, the autonomy of art, the passage of time, and the trajectory ofWittgenstein's philosophy. They appear as originally published except for the correction of obvious mistakes, the interpolation of clarifying material, and the inclusion of new footnotes to indicate Horwich's subsequent directions of thought.